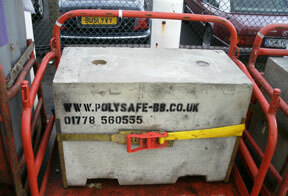 Polysafe concrete blocks are used throughout the UK when weight is required for weight testing, counterbalance or ballast – the benefit of weight in concrete form is that it can be used again and again. Brake testing for lorries during their MOT/ maintenance tests require weight, and counterbalance for cranes is another area where a concrete barrier ‘kit’ is ideal. As a pre-cast concrete company we can supply to your specification – so if you have a requirement for something, please contact us. 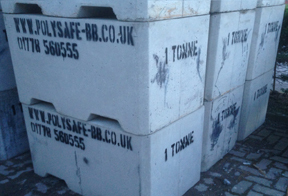 Polysafe concrete blocks are manufactured to the highest standards in a range of sizes and variations to suit your needs. Visit our before ordering and site preparation pages for advice on placing your order.